Best case scenario: The helicopter is dropping off clean water, gas and supplies to the mountain huts. Or perhaps it’s carrying out last month’s toilet deposits from hut visitors…well, it all has to go somewhere! Worst case scenario: It’s a Search and Rescue (SAR) helicopter rescuing some poor soul from the unthinkable. It’s the latter we’ve learnt most about in the last couple of days. Not because we’ve had any problems, but because we met a guy who spends most of his time rescuing people. And, even more amazingly, we just so happened to meet someone he rescued. As two city kids, Mat and I were intrigued. 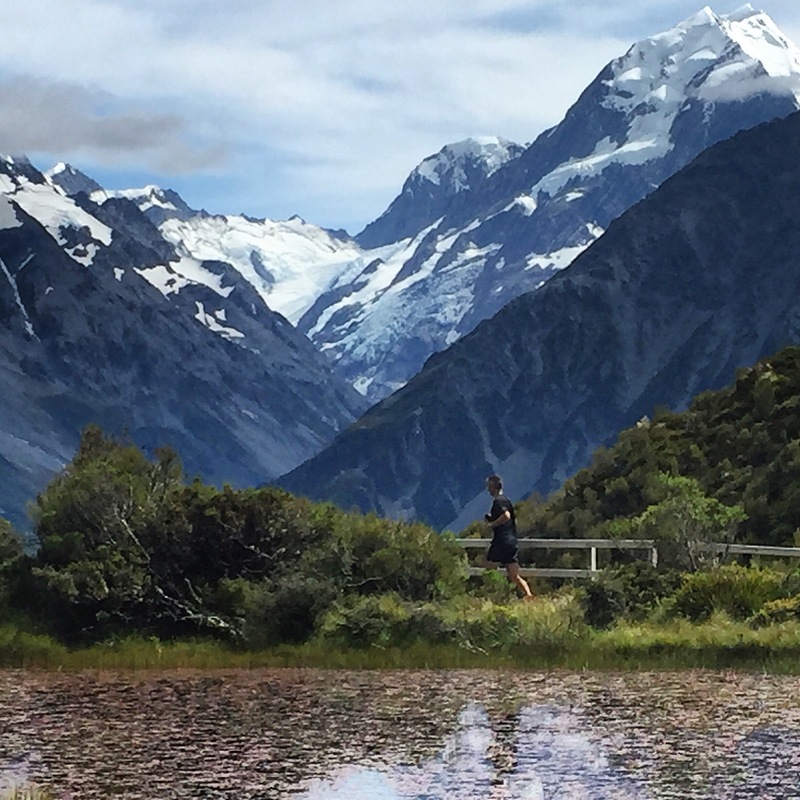 So when we arrived at Mount Cook for a week of walking and running without our rucksacks or a real plan, we headed straight to the visitor centre to see if Ray was around. He wasn’t, but he’d been there just that morning, the lady told us. “He was around for a few hours talking to visitors about the area. He’s full of information, you know.” We knew. Fantastic! We quickly replied saying we’d be over that afternoon. His offer of food and cleanliness was wonderful, but we were more interested in an afternoon picking his brain. A couple of hours later, after a particularly sweaty run up 2,200 steps to the Sealy Tarns, we knocked on his door. Turns out he is the manager of the search and rescue effort here in the park and, while on standby, he isn’t allowed to be more than 15 minutes’ walking distance from the emergency services building. That day, he’d already oiled his deck, gone for a run and watched the rugby sevens to keep himself entertained. Over the next couple of hours, he took us on a tour the facility, which is just around the corner from his DOC-owned home. 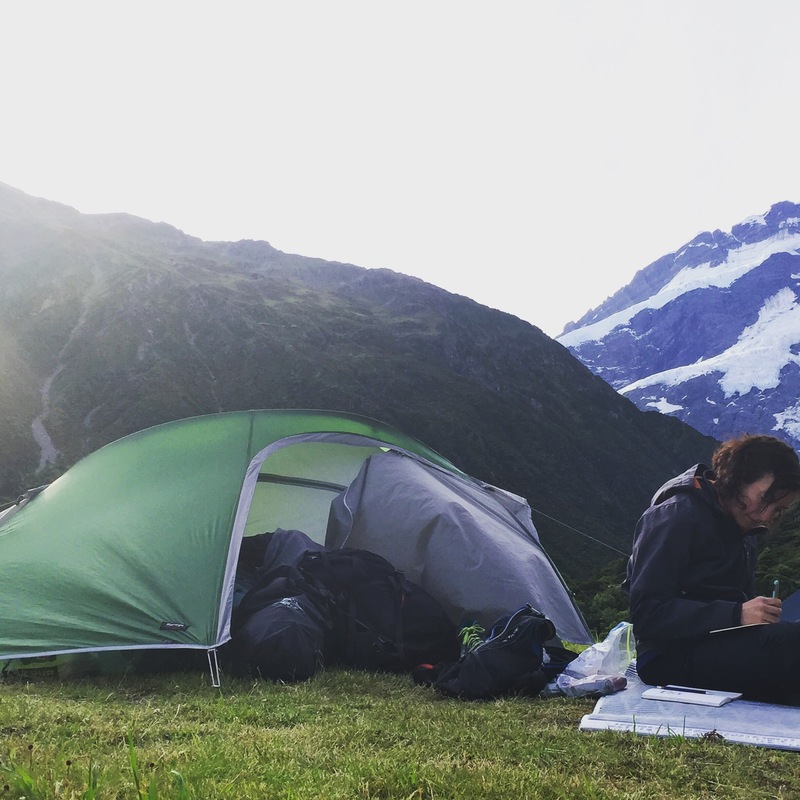 The first room looked just like your average office meeting room, but the oversized map of the national park, with its detailed peaks, glaciers and ridges, gave away it’s true purpose. This was the SAR strategy room, where the team would gather and work through the rescue effort. Mat and I looked at each other in penny-dropping realisation. Ray was in the team that rescued a TA NOBO tramper we had met just last week. Like us, Virginia had set off from Stone Hut on Australia Day, but travelling the opposite direction. A few hours later, while we were summiting the highest point on the trail at Stag Saddle, Virginia mis-stepped on the trail down near Bushy Stream, fell and dislocated her shoulder. 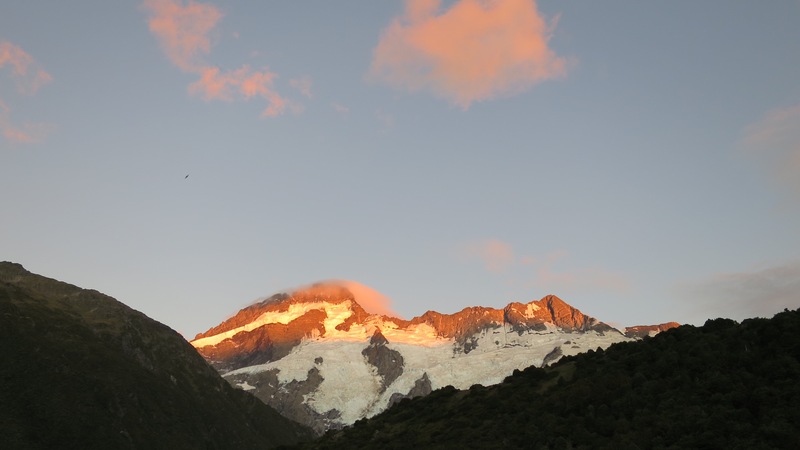 When she hit her personal locator beacon, it was the Mount Cook team that responded. Virginia’s details and location coordinates would have been the focus of the strategy room we were standing in, while the chopper set out to find her. That, Ray assured us, was one of their easy rescues. 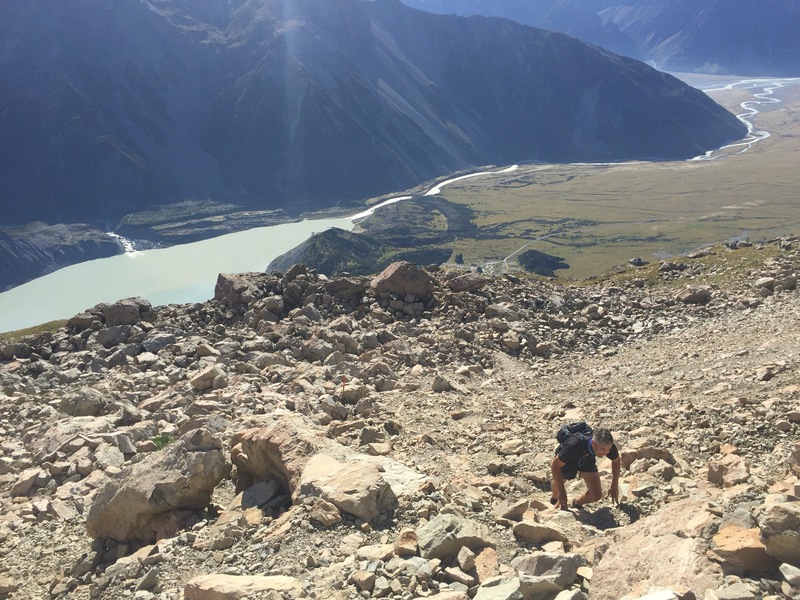 Since Christmas, there has been a number of fatalities in the park, including a Melbourne couple who fell while climbing the 3300-metre high Mount Silberhorn and 29-year-old Australian, Nicola Anne Andrews, who tragically fell while climbing The Footstool. The latter hit home harder than usual with Ray – his daughter is the same age. The next room was lined with lockers, each filled with climbing apparatus, fleece tops, heavy thermal jackets, water bottles, camping gear and more. Just like in a fire station, everything was ready to go. Next door, in the first aid room, we found out Ray is a qualified paramedic. We shouldn’t have been surprised – it seems you need to not only love the outdoors but also be incredibly skilled and highly trained to do what Ray and his team do. As a pre-requisite, he told us, you need first aid training and a high level of mountain climbing experience, not to mention the relentless maintenance of your fitness and climbing skills. DOC gives a special holiday allowance for climbing and training, and the team regularly race each other to the top of the local Red Tarns track. Still reeling from our meeting, the next day we ran, scrambled and sweated to the top of the Mueller track. Just as we reached the beautifully located Mueller Hut, the sound of a helicopter echoed around the mountains. We looked on in trepidation as it came into view and landed beside the hut. Fortunately, this time, they were here to empty the toilets. But in our eyes, even that’s a heroic task.